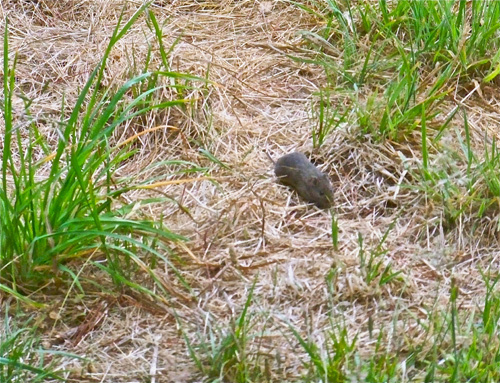 Monday morning I was watching several Juncos and Bushtits in the grass outside my kitchen window when I noticed some other little creatures scurrying around among them. At least three or four gophers were having a field day. 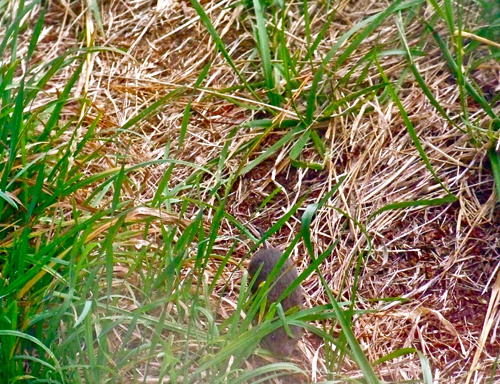 The fields around Mitchell cabin are honeycombed with gopher tunnels, but I seldom get to photograph the inhabitants. While it’s fun to watch gophers pop out of the ground, dart around like field mice, and then dive back down their holes, they can be a nuisance. For a couple of years I tried to cultivate a vegetable garden, and while I could keep the deer out, the gophers were unstoppable. More than once I noticed a carrot top shaking inexplicably only to then be pulled underground root first. 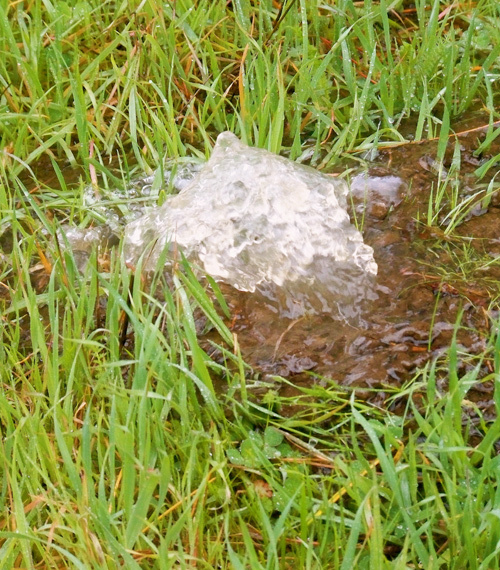 In February 2009, rainwater flowing downhill through a gopher tunnel near my cabin created this artesian well where it surfaced. For me, gophers are merely an annoyance, but for West Marin ranchers, gopher tunnels are a major problem. Tomales rancher John Jensen this week told me that according to agricultural authorities, there are 50 to 250 gophers per acre around here. The problem is that in heavy rains, hillsides riddled with gopher tunnels act like sponges, which can result in mudslides. In January 1995, gopher tunnels triggered a huge slide on Gary Thornton’s ranch in Tomales. So I wasn’t at all upset by this bobcat’s hunting gophers outside my window three years ago. 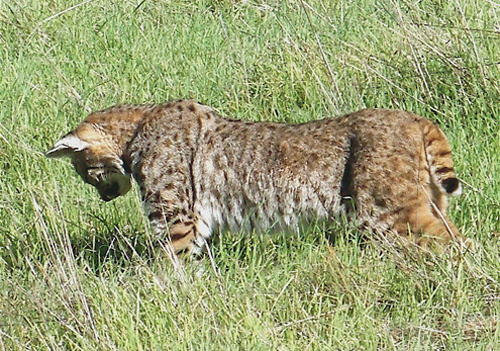 While I watched, the bobcat pounced and caught one as it emerged from its burrow. 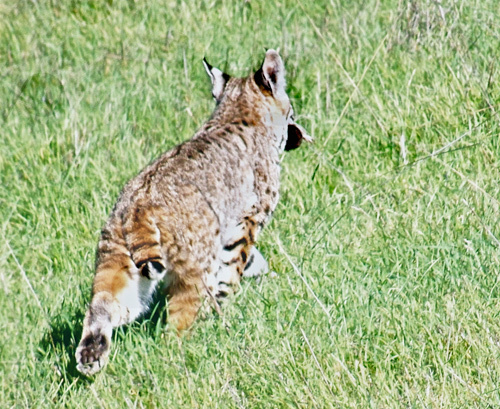 With the gopher in its teeth, the bobcat trotted uphill to dine in a patch of coyote brush. 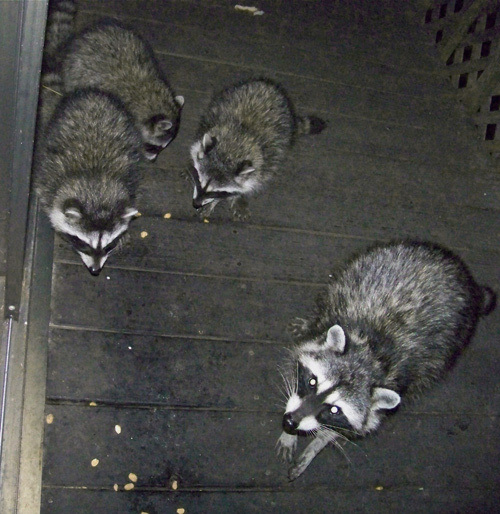 In other wildlife news, the raccoon family which showed up on my deck in late July have now become nightly visitors. 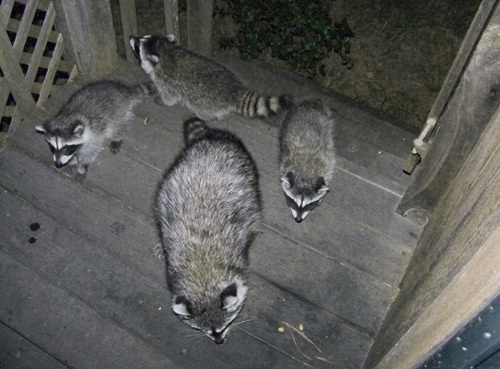 When the mother raccoon first brought the kits onto my deck (above), the youngsters had very little fear of me but kept looking around in puzzlement as to why they were there. Mrs. Raccoon, of course, knew that my deck provides good hunting for bread and peanuts. Momma likes both, and the kits immediately took to honey-roasted peanuts. For awhile, however, the young showed no interest in bread, which was unfortunate because white bread is much cheaper than honey-roasted peanuts. Eventually my girlfriend Lynn figured out the problem. The kits didn’t know how to eat a full slice of bread. Without picking up the bread on the deck, they would try to gnaw at it but would get nowhere. Lynn eventually started tearing the slices into small pieces, and the problem was solved. Their biggest problem now is getting our attention. 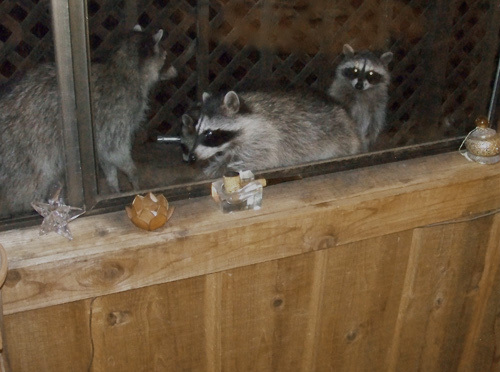 Here Mrs. Raccoon and her three kits stand on a woodbox outside my dining-room window, hoping we will see them and put out food. 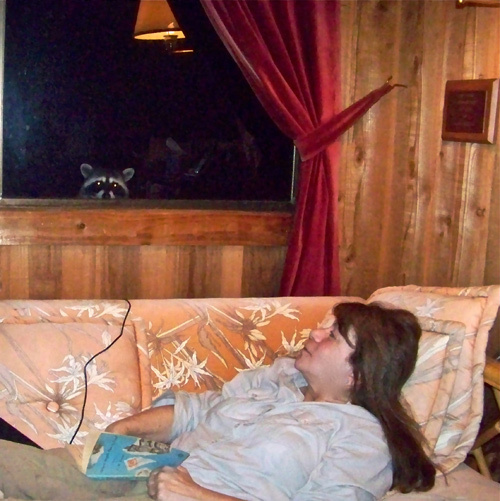 And what if Lynn and I are not to be seen when the raccoons look in the downstairs windows? Some of them have learned to climb onto the roof and peer in an upstairs window, much to the amusement of Lynn. Several of my cat-owning friends have found gophers in their homes brought in as feline presents. Unpleasant but not worrisome. Other people I know have come home to discover a raccoon has found a way inside — typically through a cat door — and left their kitchens in shambles. More of a problem. But I don’t know anyone who has ever found a bobcat in their house. 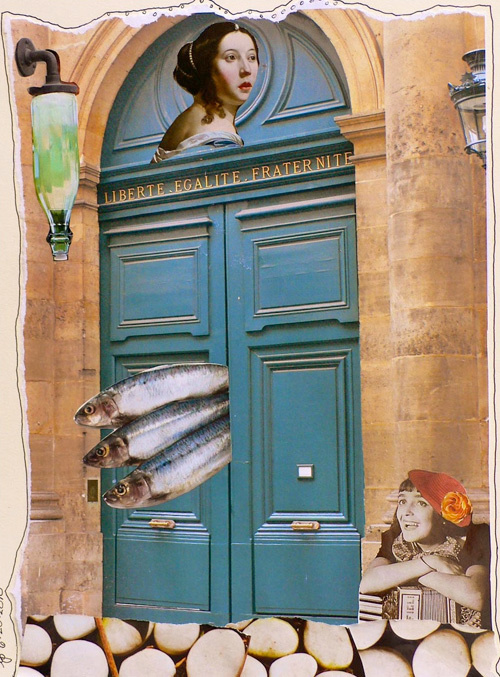 In their hen house, yes, but not their own house. If you or anyone you know has had experience with Lynx rufus in your domicile, please send in a comment and tell us about it. It should make for a good story. 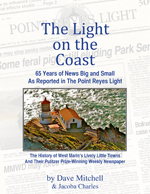 Afterward: As it turned out, two readers did have fascinating stories to tell about about bobcats — one in a house and one in a truck. 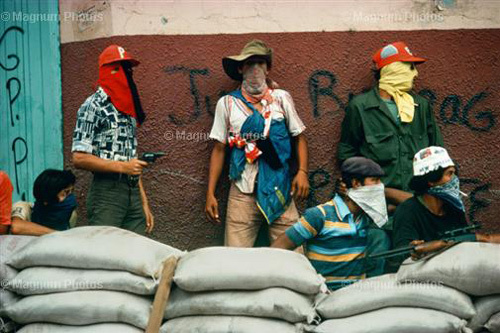 The stories can be found by clicking on the comments section above. Celebrants at Saturday’s Inverness Fair picnicked outside the firehouse on fare that ranged from hot dogs, to beer, to burritos, to ice cream. The Inverness Fair came when it was needed most. It was a dose of fun in wretched times: fighting in Libya, Syria, Somalia, Iraq, Yemen, and Afghanistan; terrorism in Norway, England, and Pakistan; famine in Somalia; financial chaos in the United States and Europe. 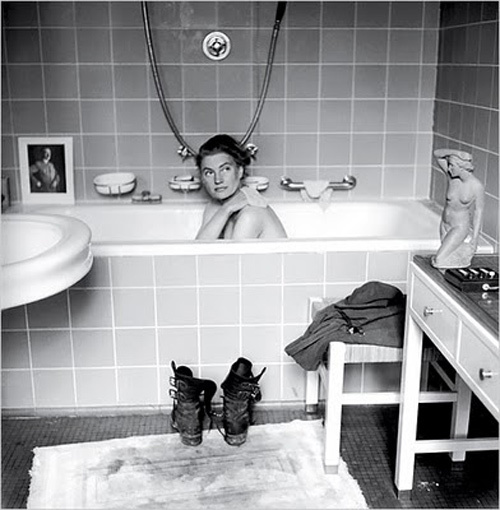 It would be easy to succumb to Weltschmerz during periods such as this. (A useful word that English borrowed from German, Weltschmerz — pronounced velt shmerts — refers to weary sadness brought on by the evils of the world, a sort of romantic pessimism.) Thankfully, for six hours Saturday on the Inverness Firehouse green, no Weltschmerz was allowed. 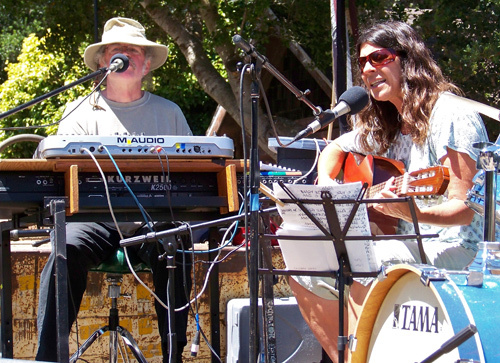 Among several musical groups performing were Kit Walker and Mariana Ingold. 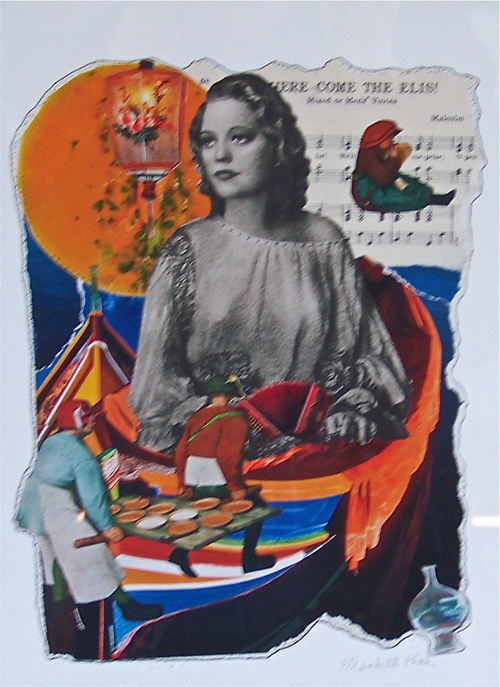 Born in Uruguay, Ingold is a composer, singer, and musician. She has made award-winning educational videos of Uruguay, Brazil, the United States and Spain. 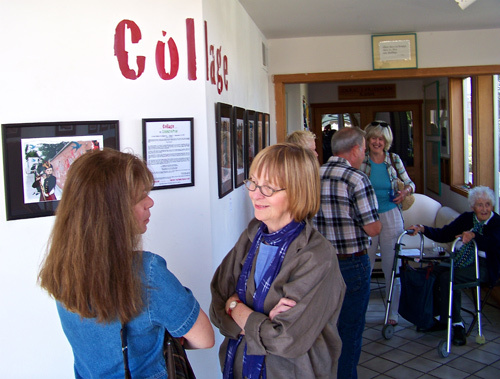 In addition, she has worked on environmental and educational projects. Ingold has released numerous albums and at present is recording with Kit Walker (left). Walker, who lives in West Marin, has recorded for Windham Hill and others. 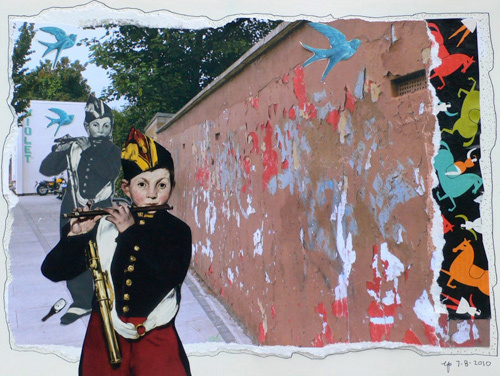 His jazz and neo-classical recordings are particularly well known. Walker and Ingold will perform again in Inverness’ Blackbird Café at 7 p.m. Saturday, Aug. 20. 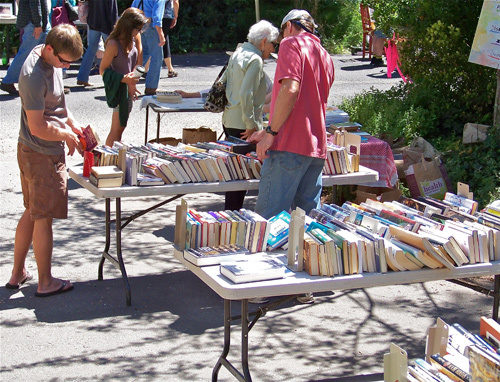 Outside the Inverness Library, tables overflowed with used books. 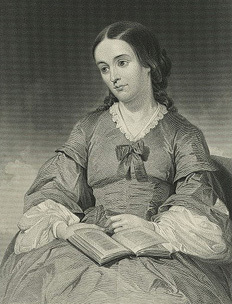 Throughout the day, a constant stream of fairgoing investigators showed up to inspect the books. 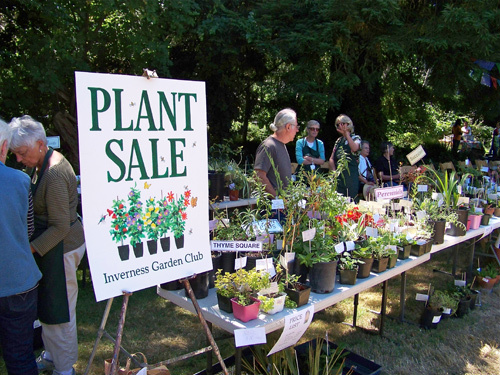 Further up Inverness Way, a flea market was similarly popular. 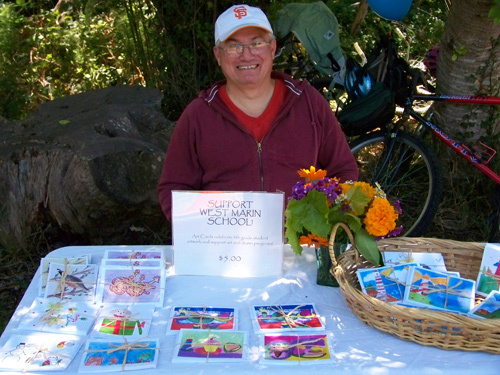 Former Shoreline School District trustee Gus Conde sold notecards to raise funds for West Marin School in Point Reyes Station. 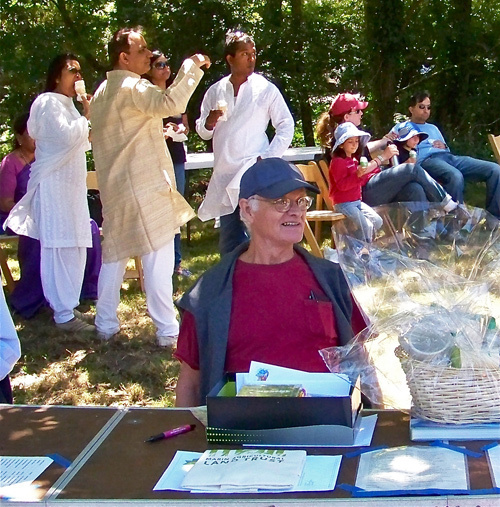 Families ate ice cream and listened to the music while Michael Mery of Point Reyes Station manned a Marin Agricultural Land Trust table. 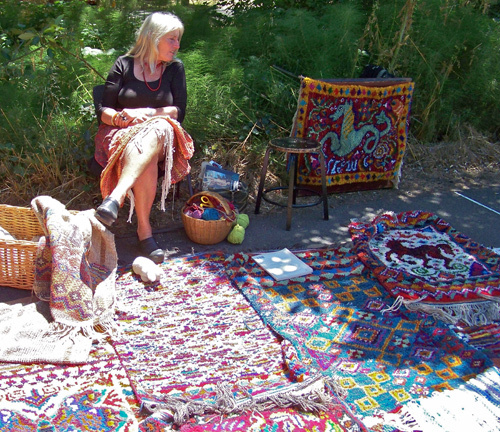 Sue Taylor of Point Reyes Station, selling her handwoven rugs, was one of several vendors who took part in the fair and added to its color. A day without Weltschmerz! Wunderbar! 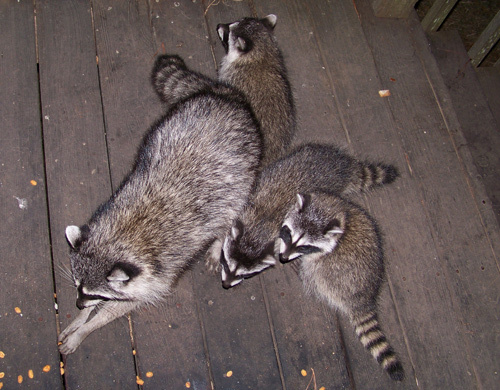 This mother raccoon brought her three kits to my deck for the first time a week ago. My wilderness includes deer in my fields on a daily basis. On rare occasions I’ve seen coyotes, bobcats, and badgers, and every night a group of smaller animals shows up on my deck. 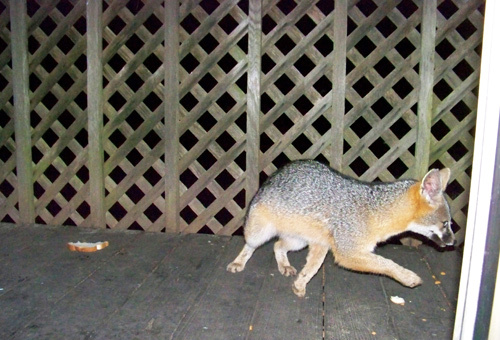 The critters at night are usually foxes, raccoons, and possums looking for bread or peanuts. It’s often easy to hear the call of the wild in my backyard. Some alpha males — especially among red-winged blackbirds and raccoons — seem more intent on driving other males away from food than with getting some for themselves. The second time the three kits showed up (right), their mother was not with them. 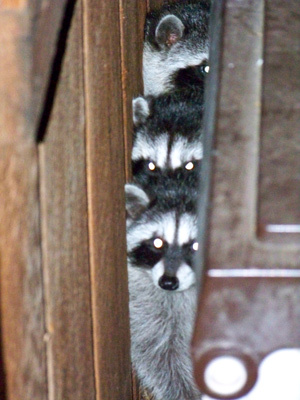 Before long, an adult raccoon began growling at them, and they took refuge in a narrow gap between my woodbox and the wall of my cabin. When the adult stuck around, they were too frightened to leave, so I finally went outside. This caused the adult to run off a short distance and provided the kits with a chance to escape. After all, someone has to keep order on my deck, and it’s fallen to me to enforce the law of the wild. The foxes get along with each other better than the raccoons do, and because they’re not intra-species rivals, the raccoons will often eat side by side with foxes when I put out peanuts. I’ve even had a possum join in, creating an ecumenical dinner for local wildlife. 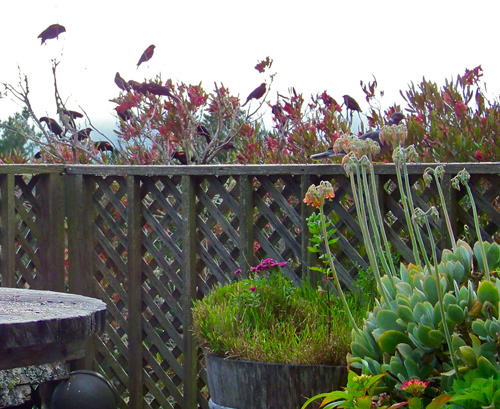 Red-winged blackbirds look over my deck prior to landing on it. Every day in the late afternoon I put out birdseed, which attracts pigeons, doves, quail and juncos, but most of all it brings in bluejays, towhees and red-winged blackbirds. The birdseed also attracts roof rats. 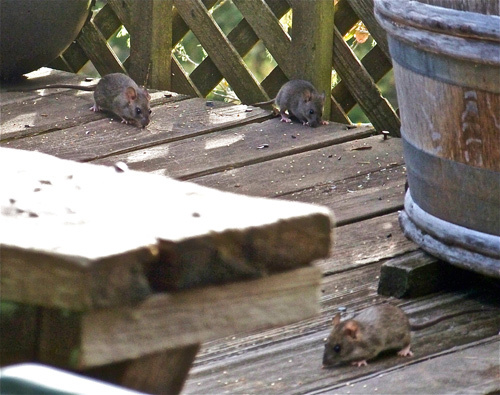 These cute little critters with long tails are amazingly good at climbing walls and railings, jumping onto the picnic table, and squeezing through tiny openings. A fortnight ago, Linda Petersen of Inverness, ad manager of The West Marin Citizen, took a week’s vacation and left her Havanese dog Eli in the care of my girlfriend Lynn and me. Late one afternoon, he, Lynn and I were sitting on my deck at sunset when Eli spotted one of the roof rats, which spotted Eli at the same time. 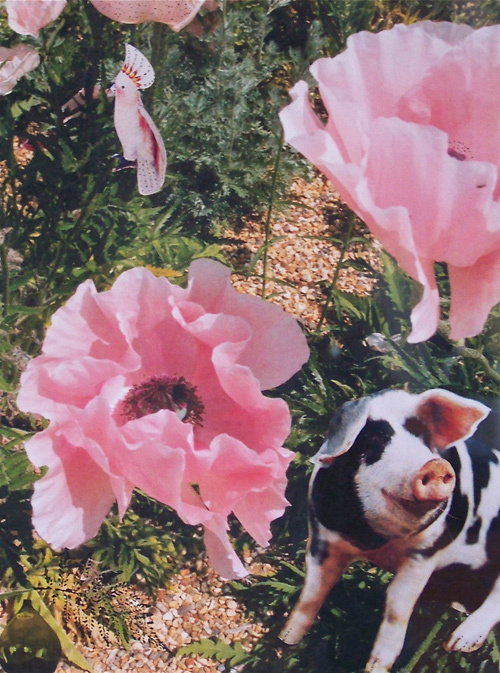 I grow flowers on my deck in wine-barrel halves, and the rat scurried under one of the barrels. 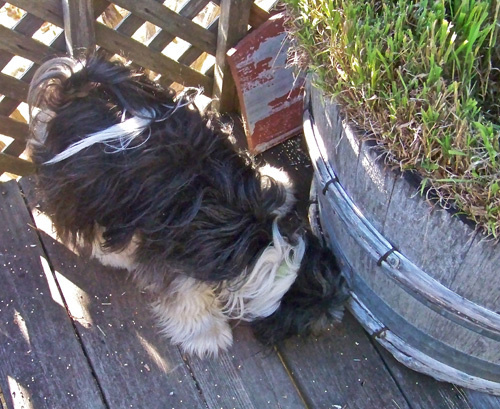 Immediately Eli was sniffing under the barrels, barking and growling. It was pandemonium. While Eli would try to drive a rat out from under one barrel, another rat would pop out from under a nearby barrel and dash across my deck to safety. Before he was done, Eli had flushed seven roof rats. It was an exciting drama, but it made me glad that — at least for the moment — I’ve been able to seal off my basement against the rats. For now, they show up only when the birdseed is first scattered. 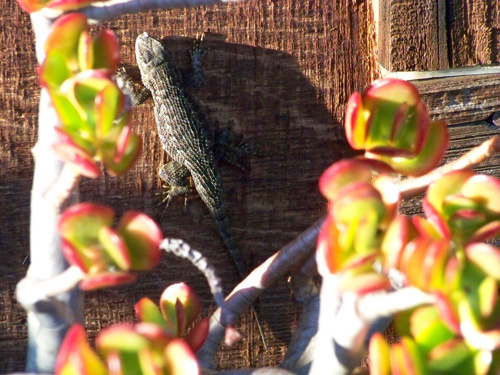 Quietly watching the drama but staying out of it was this Western fence lizard on my wall. It moved very little, depending on its coloring for camouflage. Fence lizards, I should note, are often dark when they first get up in the morning and become lighter as the day grows warmer. Kind of like the rest of us. Sparsely Sage and Timely is powered by	WordPress 4.9.10 and delivered to you in 0.760 seconds using 54 queries.